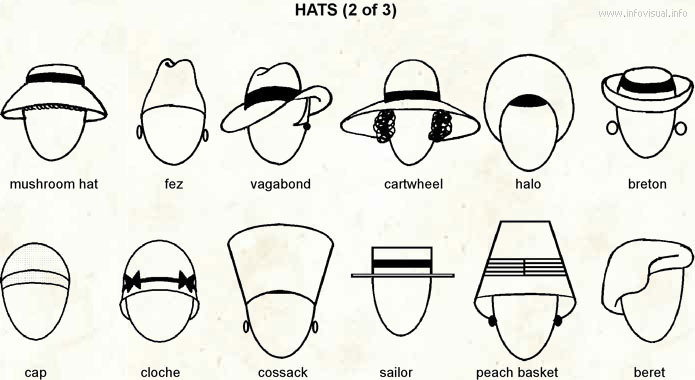 Hats 2 - Visual Dictionary - Copyright © 2005-2016 - All rights reserved. [img]https://infovisual.info//storage/app/media/06/img_en/056 hats 2.jpg[/img] [url=https://infovisual.info/en][/url] - [url=http://www.infovisual.info/]Visual Dictionary[/url] - Copyright © 2005-2016 - All rights reserved. Hats (2 of 3): headgear or accessory covering the head. Mushroom hat: headgear looking like a mushroom. Vagabond: headgear provided with a large edge protecting the face and the neck from the sun. Cartwheel: headgear provided with a large edge protecting the face and the neck from the sun..
Halo: headgear provided with only a cap. Breton: headgear whose edge is round. Beret: supple headgear provided with a fabric band. Peach basket: headgear whose cap goes up high on the head. Sailor: rigid and oval headgear with a cap and a flat edge. Cloche: headgear looking like a bell. Cap: headgear generally provided with a band.